The Grumman F4F Wildcat is an American carrier-based fighter aircraft that began service with both the United States Navy and the British Royal Navy in 1940, where it was initially known by the latter as the Martlet. First used in combat by the British in the North Atlantic, the Wildcat was the only effective fighter available to the United States Navy and Marine Corps in the Pacific Theater during the early part of World War II in 1941 and 1942; the disappointing Brewster Buffalo was withdrawn in favor of the Wildcat and replaced as units became available. 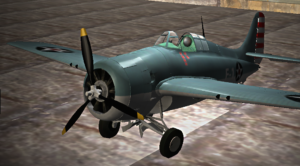 With a top speed of 318 mph (512 km/h), the Wildcat was outperformed by the faster 331 mph (533 km/h), more maneuverable, and longer-ranged Mitsubishi A6M Zero. However, the F4F’s ruggedness, coupled with tactics such as the Thach Weave, resulted in a claimed air combat kill-to-loss ratio of 5.9:1 in 1942 and 6.9:1 for the entire war. Phanotek, Inc 2018. All Rights Reserved.